Vaillancourt Folk Art Limited Ed. 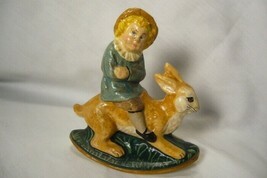 Boy on Rocking Rabbit signed by Judi! The Piece Measures 4 inches and is in Perfect Condition. Number 179 of a Limited Edition of 200.